For this month Sugar High Friday, hosted by chocolate master David Lebovitz, the theme is (obviously) chocolate, not in general terms, but by brand. As I grew up near the Italy-Switzerland border, my entire childhood has been surrounded by chocolate of different kind and shapes: Lindor all year long (bought by kilos…), bunnies end huge eggs for Easter, bars of any flavour (my favourite is the big bar of milk chocolate with whole hazelnut!!! ), many different kind of pralines, truffles, orangettes covered with chocolate… One of my friends’ mother worked at the Lindt factory and her house was constantly filled with chocolate of any kind: we had it after lunch, for the afternoon break and often while we studied! But variety doesn’t always mean quality! Lindt chocolate is good quality chocolate, with a high percentage of cocoa and I was lucky enough to have tasted some good quality chocolates in Torino and France. But recognising quality doesn’t always lead to use it to cook a chocolate cake or cookie! I’m guilty as charged: when I want to make a chocolate dessert at home I go for the cheapest chocolate. Why? Laziness? Probably… Greed? Probably too… I realize that if you use Valrhona your cake sure tastes better, but when you cook 2 or 3 chocolate cakes a month (because your friends are so incredibly voracious) you forget about high quality and you choose the cheapest with the highest percentage of cocoa! And so it was for those cookies! The original recipe (from Nigella Lawson’s Feast, for the memory of which I have to thank THE Cream Puff: I’ve almost forgot how amazing that book is!!!) 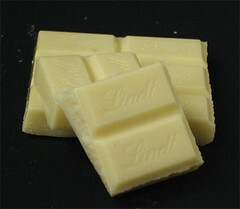 stated only white chocolate, but as white chocolate is often not even considered chocolate, I used half white and half dark. The white is Lindt (which produces the best white chocolate you can find in supermarkets) and the black is Zaini, a brand produced in Milan, with 50% minimum of cocoa. 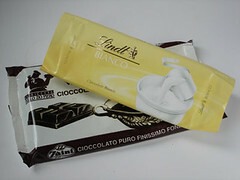 Zaini has the main advantage to sell 400 g bars, which are quite handy when you use a lot of chocolate. I wouldn’t recommend it for a chocolate tasting night, but it’s fair enough to cook with. Beat butter and sugars together, until you obtain a soft cream. Add the egg and beat until smooth. Then add the dried ingredients, beating constantly. Fold in cranberries, walnuts and chocolates. Let it rest in the fridge for 15 minutes. Cover two baking sheets with greaseproof paper. Lay spoonfuls of batter, far between, and squish them down with a fork. You should have approximately 30-32 cookies. Cook for 12-15 minutes, until golden. After cooking, let them cool on the baking sheets. So glad that you took another look at Feast! Isn’t it wonderful! 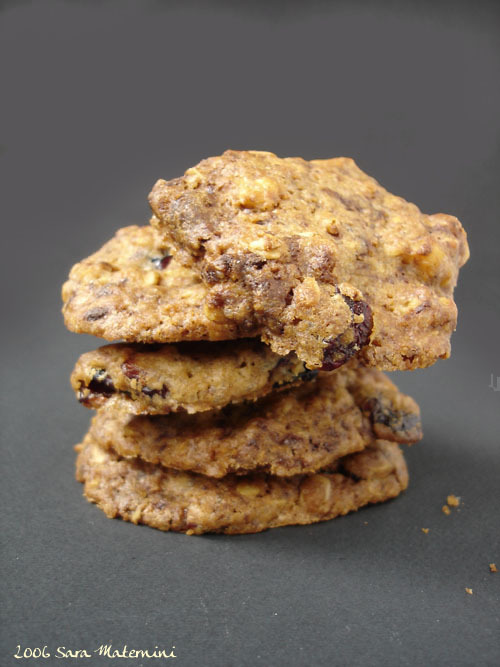 I love these cookies that you made because they feature two of my favourites: Lindt chocolate and cranberries. Have you ever tried freezing Lindors and then chopping them up and adding them to ice cream? Amazing! @Cannella: they are more then that!!! @Ivonne: that’s the greatest idea I’ve ever heard in my entire life!!! I’m going to put some in the freezer right now!!!!!! Thanks! That stack of cookies look so appetizingly good! i could almost hear the crunchiness of the outer layer and taste the chewy center. Those look fantastic. I’m always on the lookout for a new cookie recipe and this is one I haven’t tried. Looks delicious!